Flipkart Mobile Bonanza Sale will start from next week. Flipkart Mobile Bonanza sale offers customers great deals and bumper discounts on smartphones. In Flipkart sale Asus, Xiaomi, Realme, Nokia, Google and other companies will be offered with bumpers offers on the phones. Customers will have a chance to buy cheaply many smartphones including Google Pixel 2XL and Asus ZenFone Max Pro M1. 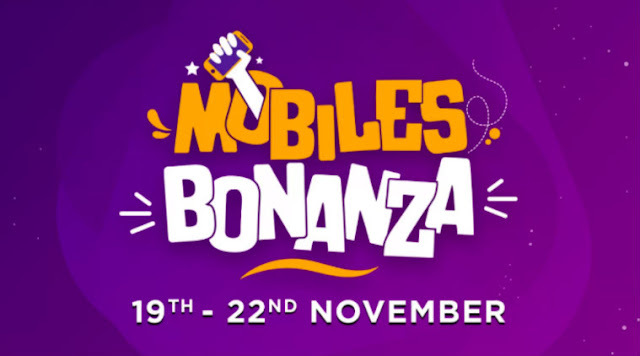 Flipkart Mobile Bonanza Sale will last from November 19 to 22 November. Flipkart Mobile Bonanza Sale customers can get Flipkart Complet Mobile Protection Plans by paying 99 rupees. This plan will also get rid of the tension of phone theft. That's because it comes with Plan Theft Protection. Flipkart Sale will also get an exchange offer with the facility of non-interest EMI on payment by HDFC Bank Card. During Flipkart Sale, 3 GB RAM variants of Asus Genfon Max Pro M1 will be sold for Rs 9,999, the MRP of this phone is Rs 10,999. 4 GB RAM and 64 GB variants will be available for Rs. 10,499 instead of Rs. 12,999. 6 GB RAM / 64 GB storage variants will also be part of the cell, but the handset will not be sold for the amount so far after the offer. During the sale, the initial price of Realme 2 Pro will start from Rs 13,990. However, how many rupees it will be available in every variant, it has not been detected yet. All Oppo's Brand Reality budget smartphone Realme C1 will also be part of Flipkart Cell. On the Xiaomi Poco F1, the first smartphone of China's mobile maker Xiaomi All Brand Poko will be given a discount of 2,000 under the exchange offer. Now talk of exchange offers. If you return 3G phone to buy 4G phone during the Flipkart Mobile Bonanza cell, then in such a situation, a discount of minimum 750 rupees will be available. The thing to note is that these offers will be for select handsets only. Rs 5,000 with LG Q Stylus, Rs 6,000 on Vivo X21 (6 GB / 128GB), exchange discount of Rs 2,000 on Vivo V11 and Vivo V11 Pro will be given. Xiaomi Redmi Note 5 Pro's 4 GB RAM and 64 GB storage variant will be sold for Rs. 13,999. Let me tell you that the MRP of the phone is Rs 14,999, but recently has cut the price of the phone by Rs 1,000. Recall that the price of the Nokia 8 Sirocco has been cut by Rs 13,000 recently. The Nokia 8 Sarcoma was launched at Rs 49,999, but now after the price cut, the handset will be sold for Rs 36,999. During the sale of Vivo V9 Pro with a discount of Rs 2,000, Rs 15,990, Vivo V9 Youth's MRP is 19,990 rupees but this handset will be available at Rs 11,990. The 3 GB variant of Oppo A71k will be sold at Rs. 8,990 instead of Rs. 10,990 and the LG K9 4G LTE 2 GB variant will be sold for 6,299. The MRP of Yu Ace is Rs 7,999, but during the Flipkart Mobile Bonanza sale the customer will be able to buy it for Rs 5,499. Apart from this, Panasonic P101, Panasonic P90, Micromax Bharat 5 Pro, iVoomi iPro, Micromax Spark Go, Yu Yureka Note, iVoomi Z1 and Micromax Canvas Infinity budget smartphones will also be sold cheaply.